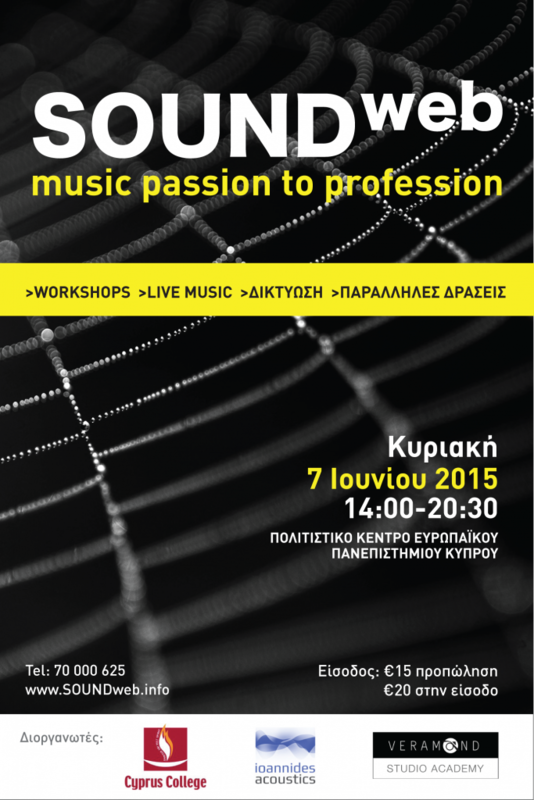 The Department of Music Technology at the Cyprus College, in collaboration with Veramand and Ioannides Acoustics, organizes the «SOUNDweb: Music Passion to Profession» music, technology and business Conference. The conference will take place on Sunday, 7 June 2015, from 14:00 until 21:00, at the Cultural Center, European University Cyprus, and aims to provide a networking and training platform for professionals and amateurs engaged in the field of music and technology. Lectures/Workshops will be held on subjects of Orchestration and Digital Music Production, Sound Engineering, Acoustics and the Music & Entertaining Business. Stereo Mike, a.k.a Michalis Exarchos, music producer with an international recording contract, performer and lecturer at the University of Westminster, London, supports the conference with his participation via Skype. *The workshops/lectures will be held in Greek only.